You’d have to look a long way back for the last time Bianca Andreescu lost a match. Back in February, when the Canadian youngster had just cracked the world’s Top 60, Andreescu took a tough three-set loss in the Acapulco semi-finals to American Sofia Kenin, a junior rival of hers with a rock-solid backhand and brilliant court coverage. The final-four result in Mexico was a respectable result in an already fantastic season for the Canadian, but no one could have predicted what was to come next. Nine matches later, Andreescu is the BNP Paribas Open champion and is through to the third round of the Miami Open, having not lost since playing Kenin last month. Fitting that it would be against none other than Kenin that the 18-year-old Canadian would win her Friday afternoon match in Florida, securing her ninth win in a row and 30th of the year. The match started ominously for Andreescu, who would have been forgiven for being low on energy after her recent heroics, as Kenin quickly went up an early break. However, the word “lose” just doesn’t appear to be in the Canadian’s dictionary as of late, as she reeled her opponent back in with her now-infamous heavy forehands while also daring to go to the dangerous Kenin backhand. First set to @Bandreescu_ ! After going up a set, the Mississauga native would race ahead to an early lead in the second. She became frustrated, however, after not being able to convert multiple double-break opportunities, ultimately allowing Kenin to level proceedings at 2-2. But, as she’s done all month, Bianca wasn’t about to let irritation get in the way of her winning ways. A quick re-break, then one more final break in the ninth game of the set – and the match was hers. Advancing 6-3, 6-3 over the last player to bet her would have to be a satisfying result for Andreescu, who has set up a potential rematch with her BNP Paribas Open final opponent, Angelique Kerber, who faces Karolina Muchova later today. 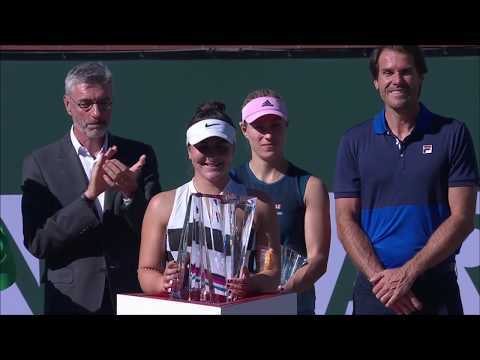 Winning is becoming second nature for @Bandreescu_! After two rematches in her first two rounds (Andreescu defeated Irina-Camerlia Begu in the first round in both Indian Wells and in Miami this week), the Canadian will have to feel confident about the possible impending one.